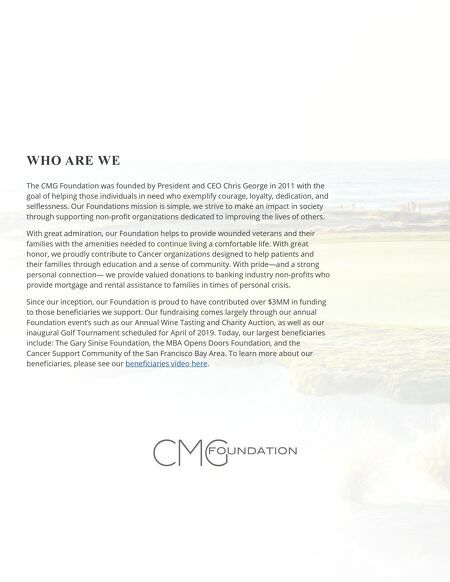 WHO ARE WE The CMG Foundation was founded by President and CEO Chris George in 2011 with the goal of helping those individuals in need who exemplify courage, loyalty, dedication, and selflessness. Our Foundations mission is simple, we strive to make an impact in society through supporting non-profit organizations dedicated to improving the lives of others. With great admiration, our Foundation helps to provide wounded veterans and their families with the amenities needed to continue living a comfortable life. With great honor, we proudly contribute to Cancer organizations designed to help patients and their families through education and a sense of community. With pride—and a strong personal connection— we provide valued donations to banking industry non-profits who provide mortgage and rental assistance to families in times of personal crisis. Since our inception, our Foundation is proud to have contributed over $3MM in funding to those beneficiaries we support. Our fundraising comes largely through our annual Foundation event's such as our Annual Wine Tasting and Charity Auction, as well as our inaugural Golf Tournament scheduled for April of 2019. 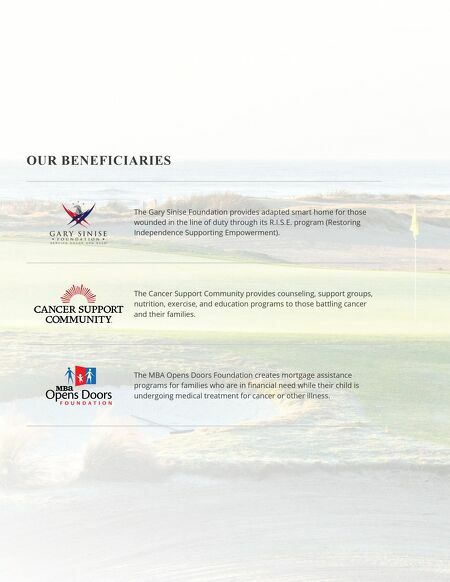 Today, our largest beneficiaries include: The Gary Sinise Foundation, the MBA Opens Doors Foundation, and the Cancer Support Community of the San Francisco Bay Area. To learn more about our beneficiaries, please see our beneficiaries video here.